HISD’s Transportation Department is looking for the best school bus drivers and attendants to join its nationally recognized team for the 2017-2018 school year. This entry was posted in News, Transportation and tagged bus drivers on April 20, 2017 by HISD Communications. With the new school year just ahead, the HISD Transportation Department is taking every measure to ensure safe, reliable, and punctual transportation for students. This entry was posted in News, Transportation and tagged bus drivers, transportation on August 3, 2015 by HISD Communications. The Houston Independent School District will be hosting a transportation job fair on Saturday, June 28. The fair will take place at the Northwest Transportation Facility (6351 Pinemont Drive, 77092) from 9 a.m. until 1 p.m. This entry was posted in News, Transportation and tagged bus drivers, transportation on June 26, 2014 by HISD Communications. HISD’s Transportation Services department is now hiring school bus drivers for the 2014–2015 school year. This entry was posted in Transportation and tagged bus drivers on June 11, 2014 by HISD Communications. The derailed train and overturned school bus may have looked like a scene out of a disaster movie, but it actually was part of a very real hands-on training exercise for HISD’s Transportation Services Department. 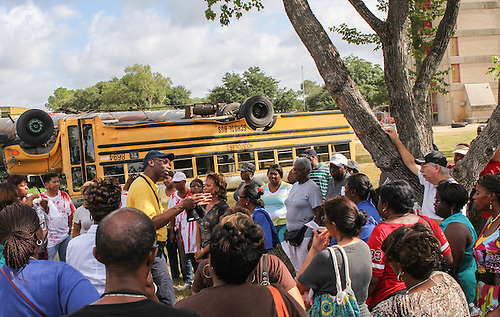 This entry was posted in Transportation and tagged bus, bus drivers, emergency drill, school bus on August 8, 2013 by HISD Communications.